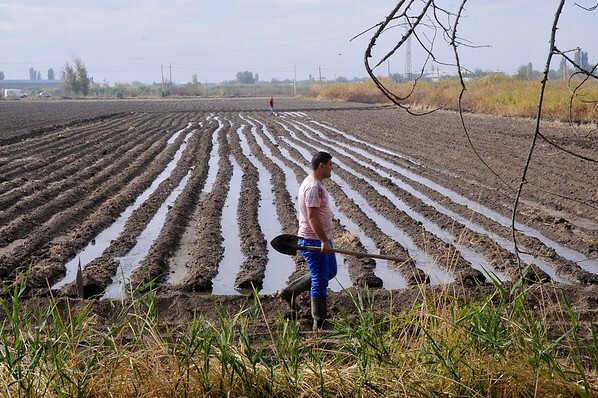 More than 252 people (from 98 households) in the village of Sayat-Nova in Ararat Province will benefit immensely from a new irrigation system. For 15 years, these families had been struggling with a useless, dormant system. As a result, they have not been able to farm very much, or they have tried to use drinking water to irrigate, which is inefficient and impractical. Many have also left the area due to this problem. Construction of the new system was made possible through the joint efforts of United States Agency for International Development (USAID), FAR, and the Small and Medium Enterprise Development National Center of Armenia (SME DNC). FAR was able to contribute to the project thanks to generous donation from American environmental scientist and engineer Dr. Anahid Shirinian-Orlando, a strong supporter of the Green Movement in Armenia and a contributor to the country’s various charitable and environmental causes. According to USAID’s studies, overexploitation of Ararat Valley’s groundwater reserves has led more than 30 communities in the region to experience a shortage of drinking and irrigation water. Lack of irrigated water hurts farmers, negatively impacts the socio-economic situation of rural communities, and leads increased migration from rural communities over the long term. The new system will provide more affordable irrigation services and more efficient groundwater to irrigate 60 hectares of community land by reusing the outlet water from the nearby Masis Dzuk fishery rather than dumping the water into its drainage network. It also has the potential to expand and eventually cover up to 190 hectares of community land, which would benefit a total of 2,400 local residents in Sayat-Nova alone. Sayat-Nova is the second community in Ararat Valley (after Hayanist Village) where this kind of project is implemented, but is the first of its kind to be implemented through FAR.